FRIDAY, MAY 20: Recognizing an opportunity, unbelieving Americans are using Camping’s doomsday scenario to host rapture parties, fundraisers, and conventions to raise awareness of their views. In America’s hotly contested religious marketplace, atheists know an opportunity when they see one. Or, as David Silverman, president of American Atheists put it, to “call out the stupid”. “When we heard the date, it was out of my mouth immediately: ‘We should have a party!”’ said Geri Weaver, president of Central North Carolina Atheists and Humanists in Fayetteville, North Carolina. Association, and members were looking for the right moment to host a “coming out party”. 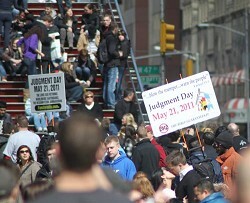 Camping’s “Judgment Day” campaign seemed the perfect pretext. The idea that atheists are using May 21 for their own purposes doesn’t surprise Allison Warden, a Camping follower who, with the help of family and friends, built a website, www.wecanknow.com, to support the doomsday prediction. “Some of the things they’re doing is a fulfilment of prophesy,” she said. “They’ve persecuted Christians in this way before. The biggest atheist event will kick off Saturday in Oakland, California, where organizers are hosting a two-day West Coast Rapture RAM, or Regional Atheist Meet, with speakers, stand-up comedy acts, maybe even “de-baptism” events. Rapture party invitations have been multiplying on Facebook and other social media sites. One website posted recipe drinks “to die for”. Others are finding campy constructions to get the word out: “Party like there’s no tomorrow”, and “one HELL of a party,” are just a few examples. Some of these events are hosted by church-going Christians, the majority of whom find no support for Camping’s predictions. Robert Fischer, a second-year student at the Duke Divinity School in Durham, North Carolina, is one of them. according to the same survey. Rapture parties are the perfect time to “ridicule and poke fun at the fools”, said Silverman of American Atheists.